Its been a real scramble the last few days so I've not been able to post, but its catchup time. 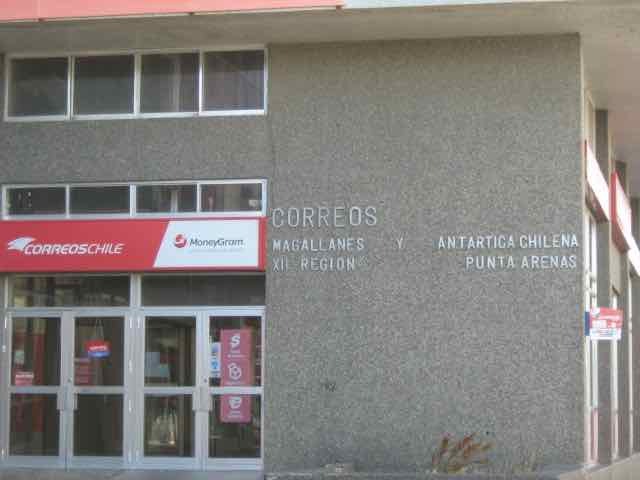 So here is a short post and some pics from our days in Punta Arenas. 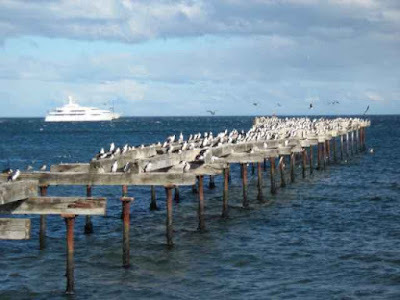 Punta Arenas, what a place. The people here have been unfailingly friendly and helpful, that means that we’ve solutions to most of the logistical issues that we came to sort out, will be seeing the Regional Commander of the Armada De Chile tomorrow, and when we’re back in Santiago have contacts within the Chilean Tourism beaureau to go and see. So we’re able to take a few hours to see the scenery, talk to people, explore a little and relax. The scenery is bleak but has a real beauty about it, the town has grown enormously in the past couple of decades and is now a tourist center with some industry as well as a lot of sheep and beef farming, its windy, cool, and the town itself has some wonderful architecture backed by the deep blue grey of the Straights of Magellan and the mountains. Nice place, we enjoyed our time there, made friends, had a very successful meeting with the Armada de Chile, and are very much looking forward to our next visit when Howard pushes off and sets his course for the south. I’m doing a lot of filming with the video camera, remember that part of the reason for the trip is to get background material for the full scale video that will be made of Howards adventure. This means that the still camera hasnt been in use as much so Im short on pics. 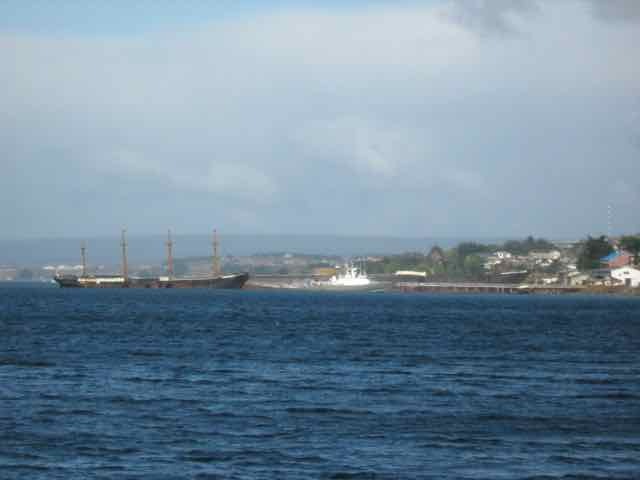 But for those who were interested in the fishing boats, I've got some more from Porvenir on the other side of the Straights. Don’t forget that this will take more than a few bucks to produce this, so please consider supporting this, it’s a way of ensuring that you can both be a part of the experience. The Boot brothers have been doing a lot of walking, I go along with them of course, they have a real tendency to get into trouble if I don’t. But Lacey, ( he’s the lefty of the twins) told me yesterday that his brothers name was really “Toe”. When I asked why he said it was because their mother didn’t want people to think that he was a “heel”. “Toe” told his brother to “hold your tongue”! I've posted some pics below, and will do some more when I get a chance. A superyacht at anchor beyond an abandoned jetty, the birds are all leaning hard into the stiff wind that prevails here. 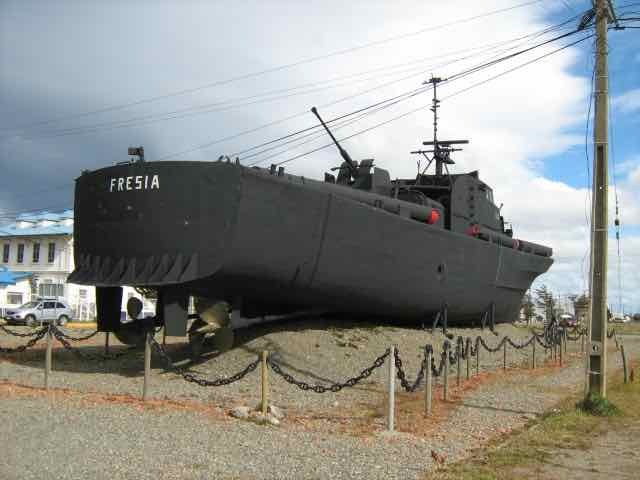 One of the old torpedo boats that used to patrol the southern area of Chiles coast, I imagine that life on board would have been very hard. But look at the size of those propellors! There is serious horsepower in there. 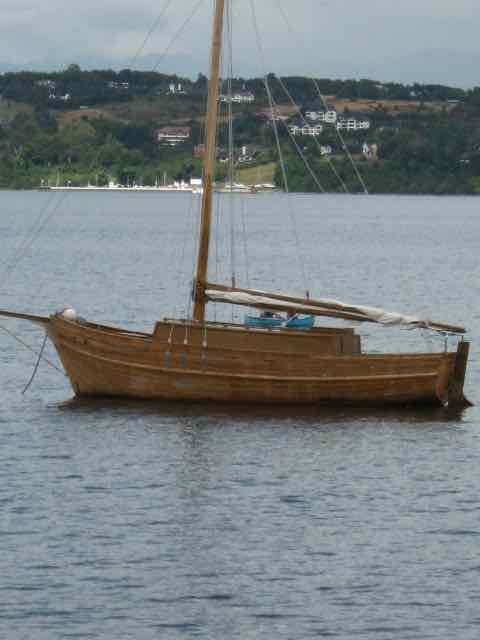 The wooden fishing boats are built very cheaply, absolutely no frills, this is the way that the "real" boats were built in the past rather than the way the seriously expensive replicas are built today. This one has come to the end of its life, its had the engine and refrigeration hold removed, and has begun returning to nature. Its not an uncommon sight here. The post office, note the area covered by this office! 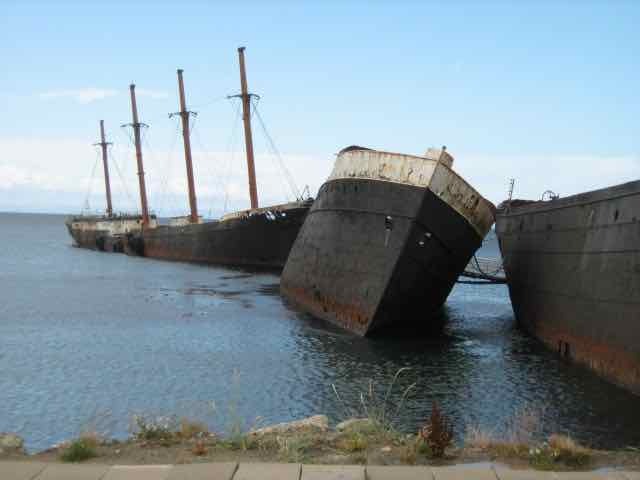 Derelict Cape Horners, they're being used as a breakwater, a sad end for proud ships. I love my little dog, he's my best friend and we go for a walk almost every day, in fact if we dont he makes sure I get reminded. Forcefully! 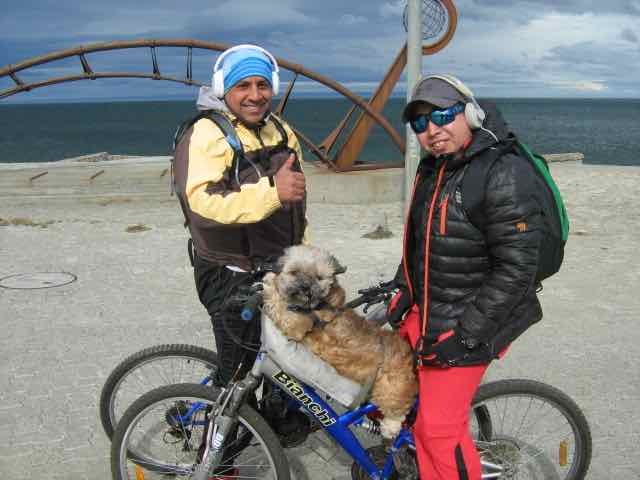 But I used to ride a bicycle for excersize, and this gent and his doggy friend have found a way to make it a team effort. The dog is lying on a cushion strapped to the bike, has footrests for his back feet, and a safety belt. He's a happy chappy, loves the ride. Nice work team! 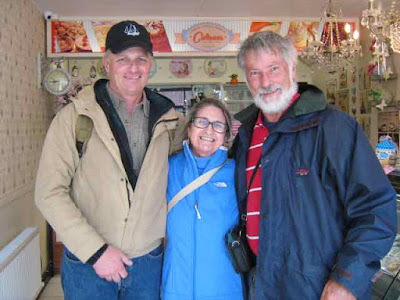 Lily from Chile, we met her in a bakery, her late husband came from Michigan where Howard lives and they had lived in California for a long time. 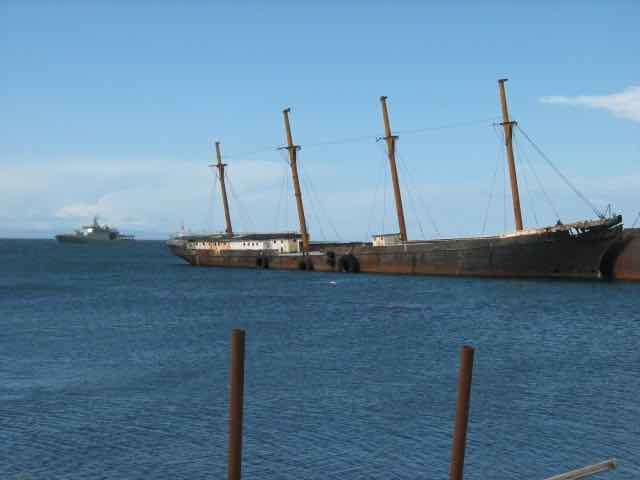 She came back to Punta Arenas when he passed on, its her home town. Lovely lady, we had a lot of fun talking to here and in a very few minutes we were friends. This is a story that has happened to us over and over again here in Chile, they are very hospitable and friendly people. Its been a very good day today. One of the jobs that we’d come here to Punta Arenas to do was to contact the appropriate people in the Armada de Chile, ( navy) and discuss with them the upcoming voyage by Howard in his modified SCAMP. 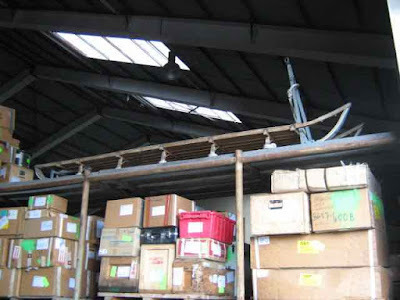 Another job was to find storage for the boats shipping crate plus scope out the town to find the resources we’d need while staying here during the pre voyage testing and provisioning. Well, today was the day of the appointment with the zone commander for the Armada. While we were reasonably confident of a good reception there were a few nerves as we were ushered into the “boss’s “ office together with two of his senior staff. At first our impression was that they were wondering what this was all about, a tiny boat, singlehanded in that region is a vefry high risk venture and it would be their resources that would be at risk to pull anyone in trouble back out to safety so they’re rightfully sceptical of anything outside of a properly equipped expedition ship. But as the interview proceeded and a series of “Gosh moments” came and went, the atmosphere warmed, there was recognition of the work that has gone into the boat and its gear, the thought and preparation, the experience from Howards previous trip, the courtesy and respect shown in our having come here 6 months ahead of the voyage to make contact and discuss with them what would be needed from their point of view. Howard had put together a short power point presentation, during which his Cape Horn certificate came up, and Captain Herrera instantly smiled, said “I’ve got one of those” and there was an instant connection, that’s the second time that’s been an icebreaker ( metaphorically speaking, its not that cold here, in the summer at least) for us. 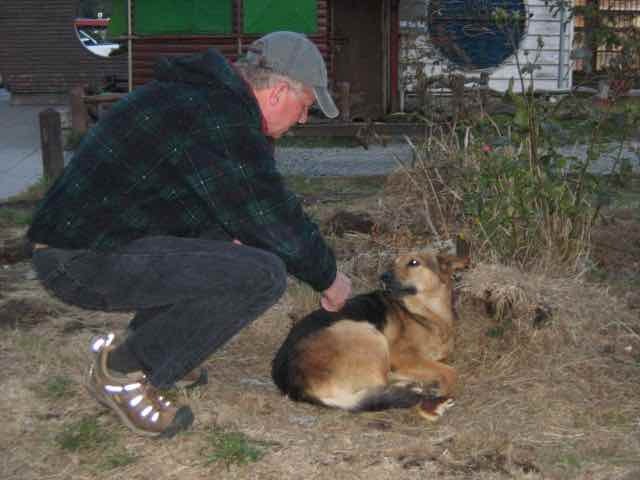 Another moment, those who’ve attended Howards presentations on his voyage around Cape Horn in his 15 ft Klepper folding kayak may recall his tale of walking through a minefield following the lighthouse keepers dogs. Some have been skeptical of that part of the story, but Captain Herrera confirmed that the mine field was indeed there, and still “alive” at that time. Since removed by Chliean special forces though. Much hilarity! There were some suggestions as to communications equipment and agreement on their part that the planning on Howards part was comprehensive and for the most part well executed. There are a few small things to consider, and their experience in that area means that their input has real value. So the interview went very well, and it was with cordial handshakes that we parted, all of us looking forward to meeting again in September next. The other issue, that of storage and generally having friends upon whom we can call when needed has been solved, oddly enough by a rainstorm overcoming a rusty roof and the ceiling in a restaurant collapsing while we were mulling over where to start looking while having coffee. Mauricio and his staff coped with the problem calmly, moving us and a couple of tables away from the deluge. We made jokes about serving towels and shampoo with the coffee, there was much laughter, some conversation and from that friendships have grown. Proprietor Mauricio has offered his backyard for storage of the shipping crate, knows the area well and may be able to suggest accommodation when we’re down here next and has proven to be a most cordial and interesting friend. We have been eating regularly at “El Bodegon”, half a block from the city centre, it’s a great place, we get a warm reception when we go in, not only smiles but there is a big wood stove heating the dining area so its shirt sleeves when outside is distinctly cool. Our friendship has grown to the point where we can ask for Tony the chef, and tell him that we’d like him to cook a meal, whatever he’d like to cook, and to surprise us. We’ve had some great food, and strongly recommend the place to anyone coming here! El Bodegon restaurant and bar, you’ll like it! 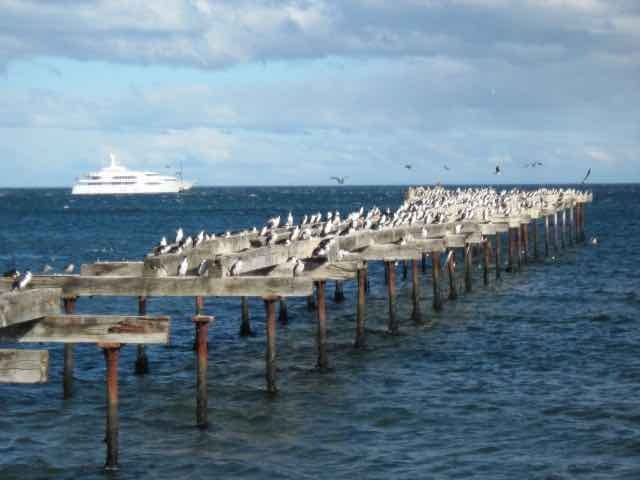 Punta Arenas, a fable for most people. 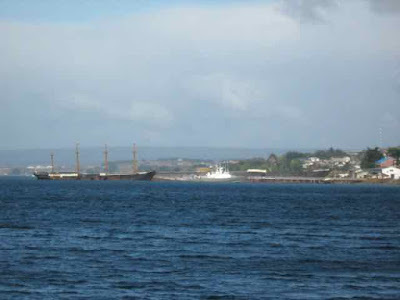 Punta Arenas, when we read cruising stories, or those tales from the round the world yacht races, or old Joshua Slocums book it seems a place of mystery and dreams. But now we're here, its very real. What a place. 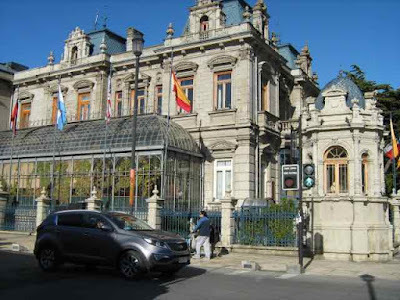 The people here have been unfailingly friendly and helpful, that means that we’ve solutions to most of the logistical issues that we came to sort out, will be seeing the Regional Commander of the Armada De Chile tomorrow, and when we’re back in Santiago have contacts within the Chilean Tourism beaureau to go and see. 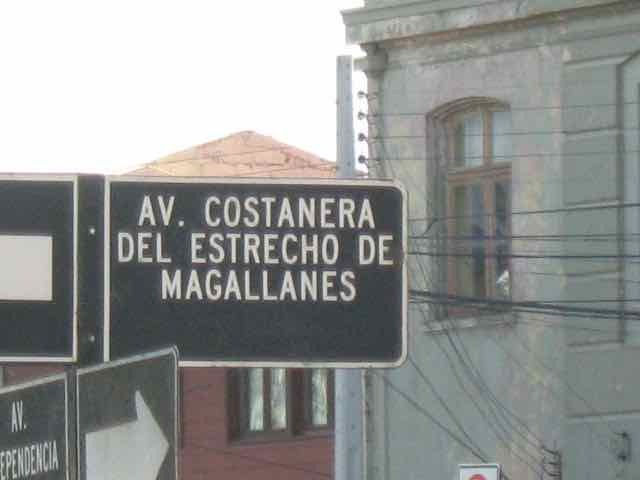 Avenas Costanera Del Estrecho De Magellanes, the Straights of Magellan. A place steeped in sailing ship history, here's the sign indicating the coast road past the city just to prove we're really here. I’m doing a lot of filming with the video camera, remember that part of the reason for the trip is to get background material for the full scale video that will be made of Howards adventure. Don’t forget that this will take more than a few bucks to produce this, so please consider supporting this, it’s a way of ensuring that you can both be a part of the experience. Heres the website link. 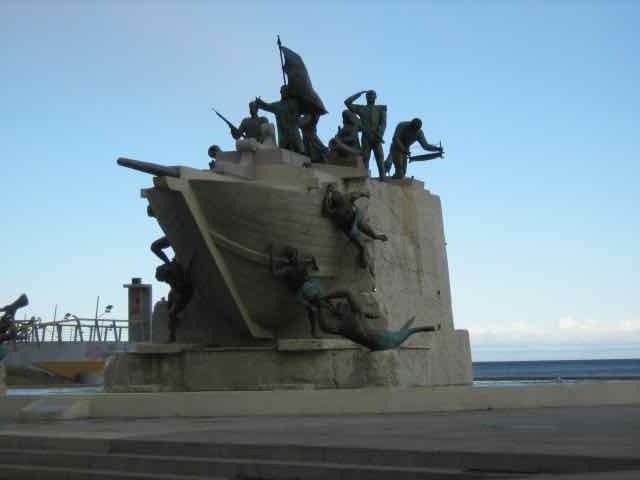 Chile is big on memorials and statuary, this, as far as I can tell, is a memorial to the first settlers. Huge, elaborate and interesting. 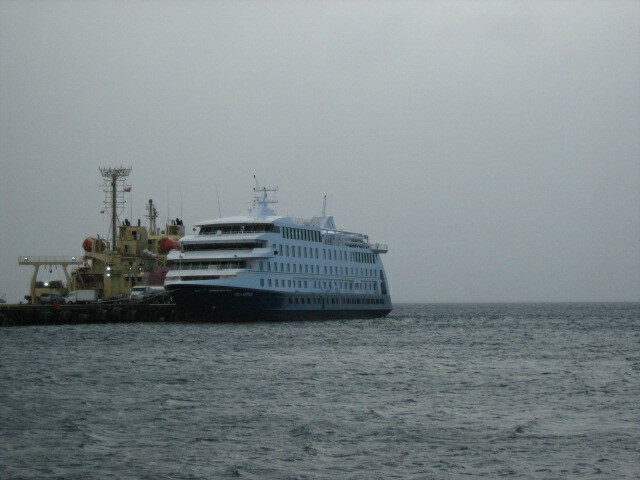 The water behind is the straights between the mainland and Tierra del Fuego, the land of fires. This pic was taken from the doorway of the warehouse for the Antarctic supply ships, thats a real live dogsled up there. The city is full of wonderful old buildings, this one has a historical rating. But consider how far south we are, and how the building has been adapted to the conditions here. Big and designed as a mass to conserve heat but the big conservatory there to gather sunlight and direct the warmth back into the building. Solar gain is not a new thing, its been well understood for many generations. A graveyard of dreams and ships. These are Cape Horners, there are the remains of wrecks all along this shore, skeletal remains sticking up out of clear frigid water, ships that came this far and couldn't make it further, the end of the line at the bottom of the world. The town though is vibrant, growing fast, lots of new infrastructure, good roading, tidy and clean. This is I think fuelled by tourism, cruise ships come through here a lot, some are based here ( see below) and its a service center for quite a large farming community. 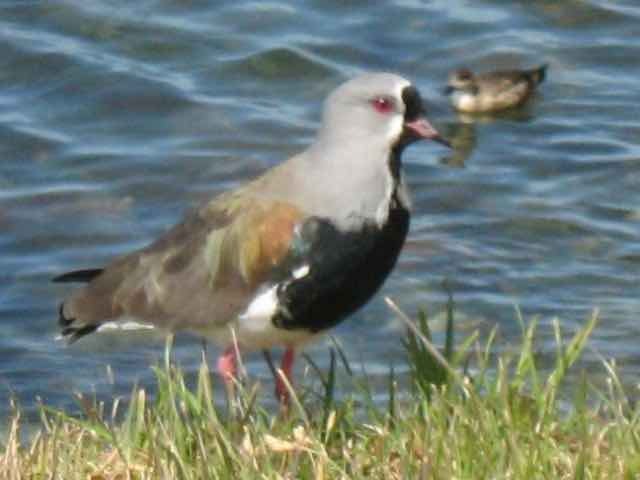 Pics, from a walk along the waterfront. We’e been to Puerto Varas today, the main town on a major lake near here. Its very different to the larger city nearby where we’re staying, clean and tidy, the buildings for the most part more modern and up to date, no potholes in the footpaths and everything nicely painted. Very few dogs by the way but Howard managed to find a couple of them and gave them a little to eat. 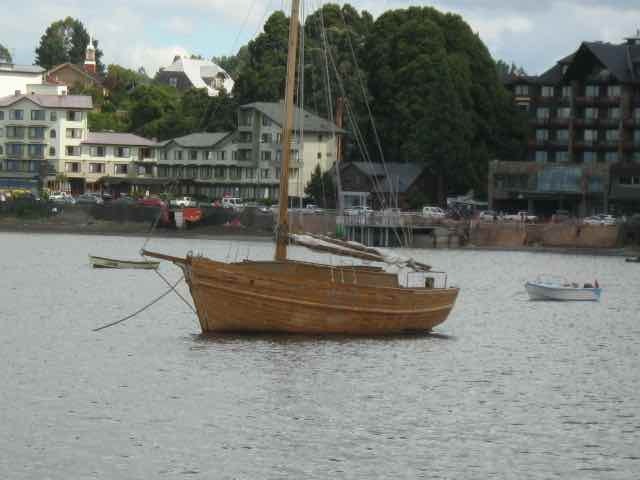 But while walking the waterfront we spotted a workboat, the same little sailing coastal cargo ship that our new friend Jaime builds, and this may in fact be one of his, who knows, but there are very few of them being built so it could well be. We’re back in Puerto Montt again, the Boot Brothers have been out for their evening walk, we’ve had dinner, and this will be a relatively early night as we’ve a big day tomorrow. We’ll be flying down the western side of the Andes, the distance is a little over 800 miles, ( 1300 plus kilometers) so we’re expecting to be aloft for two hours if it’s a jet, or three and a half if it’s a turboprop. Either way it would be a long way if we had to walk. We’ve five days in Punta Arenas, quite a few tasks to get through but if we can get them done there is a good chance we’ll head out into the wilds and camp for a couple of days. I’ve no intention of emulating the Antarctic explorers, but at this time of the year the average temperature is around 16 to 18 deg C which is not so bad. I might end up leaving my socks on while in my sleeping bag though. A complete boat this time, not just a frame. Still in Chile. The travelling boots have been doing a lot of exploring, I went with them of course, it wouldnt pay to let them go by themselves, you never know what sort of trouble they’d get into. We’ve had some issues getting from Puerto Montt south to Punta Arenas, and in the end bit the bullet and have booked to fly there, and when we’ve done the work we’ll fly back to Santiago. The first available flight was Friday, its Tuesday today so Howard, the boots and I have been exploring the Austral Highway to see what we could find. And what did we find? Stunning scenery, forest clad mountains dropping precipitously into the sea, the road clinging to the cliffs around the headlands, groups of tiny houses behind little bays, fleets of near identical open fishing boats anchored off and more hidden in the creeks and behind sandspits. We came across these, they're decorative rather than sailing, but interesting and that deep bellied broad beamed shape seemed very consistent with the shape of the very few full sized ones we'd seen. But look below, we found a real one! 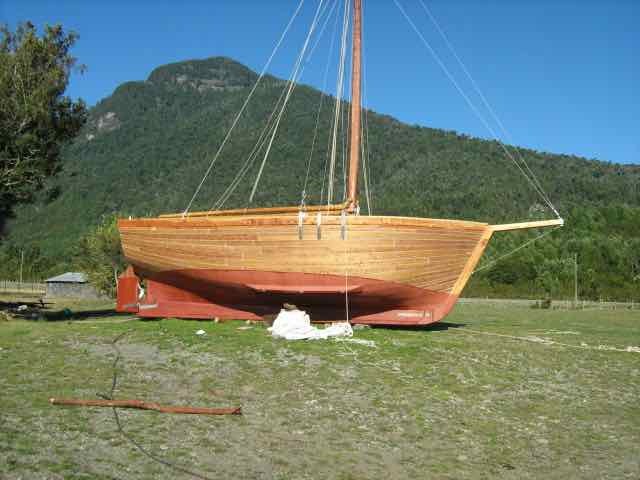 The really serendiptitous discovery though, we having an interest in boats and sailing in the deep south of Chile, was a big traditional sloop rigged sailing boat sitting in a paddock. The view from the road. The sea shore is literally just beyond the edge of the grass that you can see. 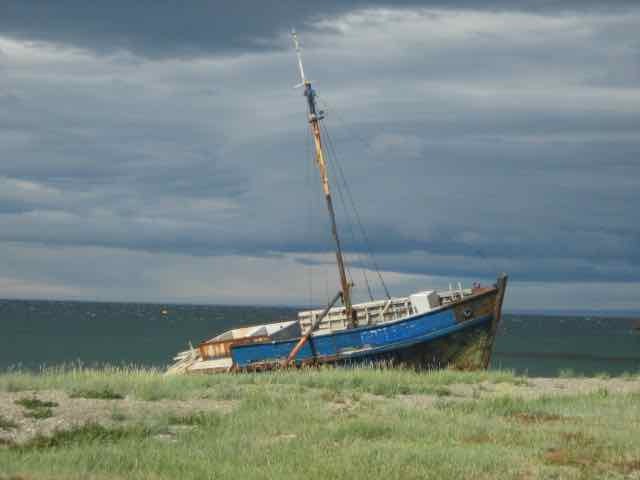 This boat will be winched along the grass, turned at right angles and dragged down the beach by a tractor, then left until the tide comes in to float and sail away. They're exceptionally rugged little ships, designed for just this kind of use. The shed on the right is where the next one is being framed up, and to the right of that are classrooms. 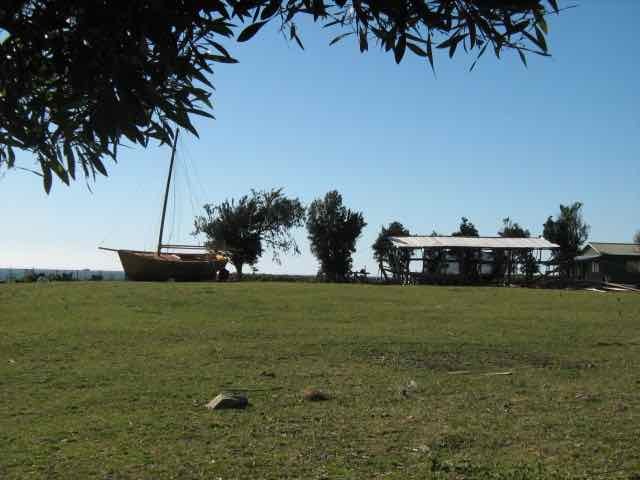 Wouldnt you like to spend some time there with an adze and a hammer! We pulled over intending to look over the fence, the boots though decided that they’d walk me over there to have a closer look and while they carried me around to take photos Jaime the owner came over to see what we were up to. Shes about 35 ft by perhaps 14 ft, I'd guess at 10 tons, ballasted with rock stowed in the bilges, no interior to speak of but a big cargo hatch in the deck. You would either sleep on deck or up in the bows below, take some padding, there is nothing there except boat. The rig is gaff sloop, Jaime having hand sewn the sails from medium duck canvas with 3/4in manila rope boltropes. These boats carry a crew of four when racing, but two when working for their living. Yes, this one has a motor, but thats unusual. 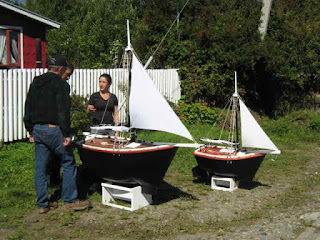 It turns out that not only had he built this little ship, typical of the small coastal service vessels that carried passengers and freight in this area, he is in the early stages of starting a school that teaches traditional boatbuilding, and he himself is the champion racer of these little ships. A view from inside the shed, thats the next boat being framed up just to your left, with Jaime and Howard up on the deck of the completed ship, that gives you an idea of her bulk, she's a serious carrier for her length and well adapted to the conditions that prevail on this rugged coast. He and Howard had a very animated conversation, one speaking Spanish with a few words of English, one in English with some Spanish, a lot of gestures and pointing. 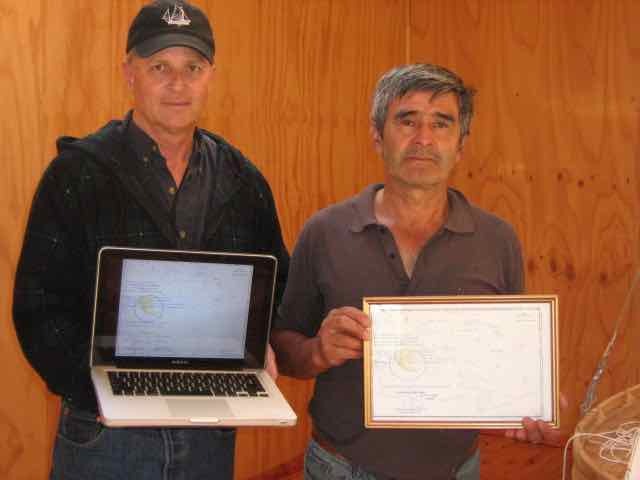 Jaime went and got a diploma given to him by the Armada de Chile for his rounding of Cape Horn in a 50 ft or so yacht, and Howard got out his laptop and pulled up the photo of his similar diploma. Instant brotherhood. 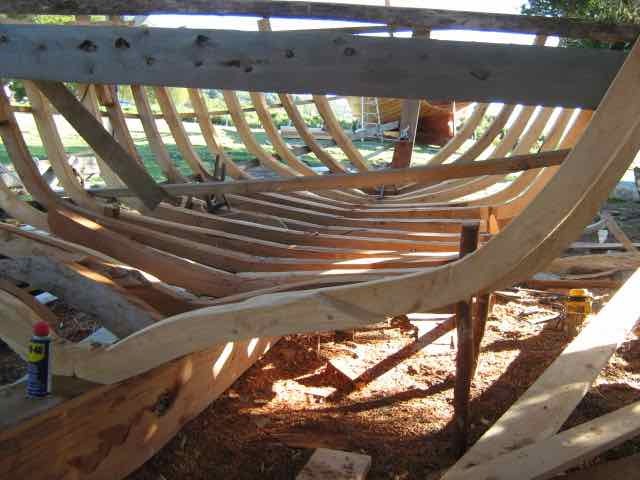 The next ship in frame, built largely by eye, heavy and very strong these are simple boats built with simple tools, using local lumber, crooks and bends selected from trees that are no longer valued for everyday purposes, fastened with galvanised steel bolts and the planking secured by big copper nails. Howard is planning to do just that, the racing is just before Howards voyage comes up, and he'll be in touch with Jaime with a translator to help bring the new friendship along. 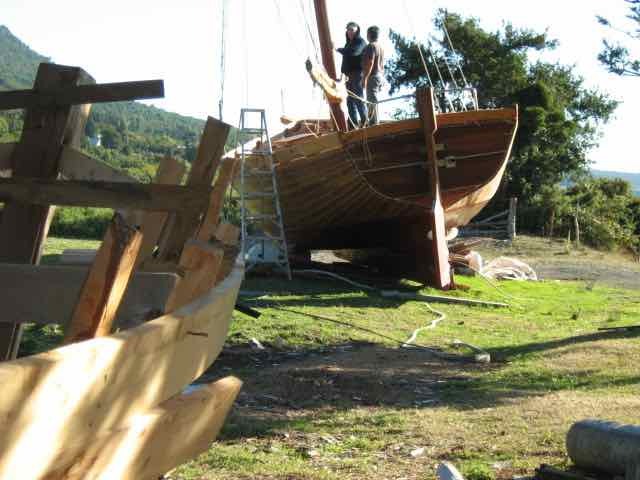 What a coincidence, a really interesting boat, boatbuilding the way it was done, a boatbuilding school, a really nice guy and and new friend. We’ve got his contact details and hope to keep in touch. Jaime Gallardo and Howard Rice comparing notes, Howard of course rounded Cape Horn in his Klepper Kayak some years ago, was awarded a certificate by the Armada de Chile, and it turned out that Jaime had done the same rounding although in a yacht of about 50 ft long, and had the same certificate. What a coincidence, great stuff. We’re in Hornoperin right now, I’m sitting up in bed in a tiny room upstairs in a “Hostel”. 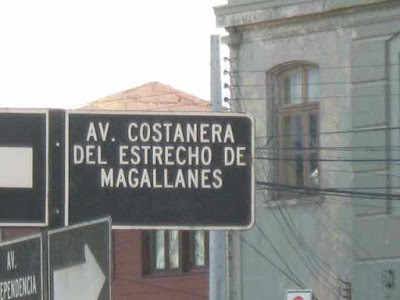 This is a lovely little town, it’s the end of the road, the next stage going south is a very long ferry ride through the northern end of the Chilean Archipelago. This is backpacker paradise, the scenery is beyond amazing, the town is supported by aquaculture which is big business here and tourism. Meanwhile, the brothers boot are telling me its time to go for a walk, so I’d better take them out. The footpath is calling. By the way, the brothers Boot are actually quite shy, but one has just told me that his name is Lacey, and that the two of them like "Sole" Music. Nice guys, we're having quite the adventure here in Chile. 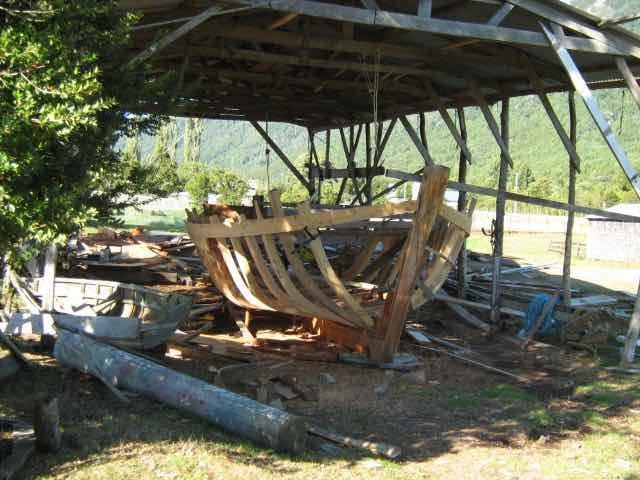 Wooden Boatbuilding in Castro, Chiloe, Chile! Santiago, a hot day and we're travelling tonight. I've been out having little adventures.